This quilt honors Eugene Cernan, Commander of the Apollo 17 mission. Gene Cernan was the last man to walk on the moon. I was intrigued by his relationship with his young daughter, Tracy (Teresa Dawn Cernan). In his autobiography, “The Last Man on the Moon”, he mentioned that before he left, he etched Tracy’s initials, TDC, into the lunar dust. Looking through photos on the NASA website, I came across an image of Cernan blowing a goodbye kiss to nine year old Tracy before he left on his third moon launch on Dec. 7, 1972. I tried to imagine how Tracy must have felt, how the astronauts’ wives felt, and the astronauts themselves. Their courage was hugely impressive, knowing the many dangers involved in space travel. On a side note, when this quilt was nearly finished, lacking only a bit of quilting and binding, I packed it to bring on a vacation so I could complete it before the deadline. Sadly, our car was broken into and all our luggage stolen, including my art quilts. I can’t describe the horrible feeling of loss!! 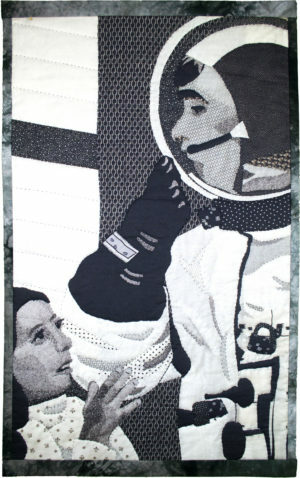 Fortunately, I had taken a photo of the nearly completed Gene Cernan quilt, pinned to my design wall. I sent the photo to an online printing company to be printed onto fabric. They rushed the job back to me, and I was able to finish just in time. In the top left corner is a printed pin, purposely left there to tell the story. Raw edge, hand appliqued collage, photograph printed onto fabric, hand quilted. Commercial and upcycled thrift store clothing fabrics, embroidery threads, printed photograph.